Thanksgiving is a holiday in which people get to celebrate the things and people they are truly thankful for. It’s a holiday when family and friends can celebrate simply being together for a meal. Around the end of November is when people begin to talk about what they’re thankful for; friends, family, health, community, etc. 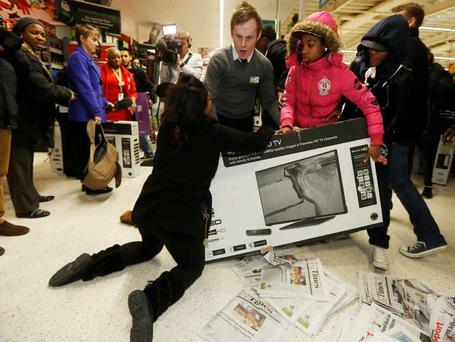 But all this thankfulness is quickly followed by the nation’s greediest (unofficial) holiday: Black Friday. Everyone loves a great deal, especially when Christmas is rounding the corner, but Black Friday has consumed too much of Thanksgiving. Quickly after thanks are given and grace is said, people are rushing out the doors to trample one another at the local Walmart. Meals are interrupted by dedicated shoppers leaving the table early and retail employees having to make their way to work. The term “Black Friday” doesn’t even seem relevant anymore considering some stores open as early as 2pm on Thanksgiving Day. The irony in the back-to-back holidays is almost laughable. One day everyone is eating turkey, thankful for those around them and the next—or a few hours later—they’re diving into stampedes over 40% off boots and discounted Xboxes. People go from being thankful for what they have to being greedy over what they want quicker than you can say Macy’s Day Parade. The simple idea that Black Friday occurs between the holidays of thankfulness and giving is a confusing concept, but unfortunately is one that is true. While it is annoying to most of us, think about the people that have to work on those days. Making people come into work in the middle of Thanksgiving Day has to be the worst thing employers could do to someone on a holiday. All those people want is to be home with their families and instead, they have to deal with angry customers. The least retail stores could do is wait until midnight to begin their sales. If anything, let the sales go later into Friday night/Saturday morning if you’re going to extend it, but don’t take over Thanksgiving.